Viscosupplementation refers to the injection of a hyaluronan preparation into the joint. Hyaluronan is a natural substance present in the joint fluid that assists in lubrication. It allows smooth movement of the cartilage covering the articulating surfaces of the joint. 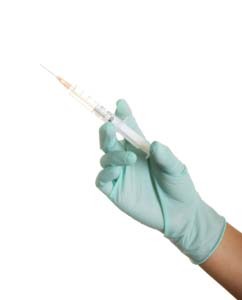 Some patients may experience mild pain, swelling, warmth and redness at the injection site for up to 48 hours following a viscosupplementation injection. Headache and joint stiffness may also occur in some cases. Ice packs and an analgesic may be used, if required, to ease the discomfort. Any strenuous activity such as jogging or tennis should be completely avoided for 48 hours to a week after the injection and should be resumed only after consultation with Dr. Patel. Please note: Immediately consult Dr. Patel if you develop fever or pain and swelling that fail to resolve after 48 hours following the injection.